Life as the single mum of a learning-disabled teenager is tough. To Izzie's alarm, all her daughter wants from life is to get married and have babies. This creates a moral dilemma for Izzie. How she can continue to protect Jaya whilst at the same time letting her go? Tanya Bullock is a college lecturer, writer and award-winning filmmaker. She has gained local recognition through ITV’s First Cut scheme; two nominations for a Royal Television Society Midlands Award, and a Royal Television Society Award for best promotional film. Her short drama, Second Honeymoon, was screened at the Cannes Film Festival. She lives in the West Midlands with her husband and two young children. Not only an entertaining read, but an immersive and thought-challenging one too. I read the book in a day....I believed in the characters and wanted to find out what would happen to them. Very Thought provoking! Great book. Well written. The plot kept me turning the pages as I connected with the characters. I couldn't wait to find out how it ended and then was gutted my read was over. Wonderful story of relationships and a mother's love. A lovely read which I really enjoyed! The most fantastic book I have read in a very long time. Wonderfully written, so clever, witty and inspirational. A great book! I had real empathy for the characters in this novel. Having taught students on the autistic spectrum for 31 years, I found the subject matter to be accurate and moving. I could really relate to the situations and subject matter. A beautiful poignant story of a mother's love for her learning-challenged daughter. A real delight. A heart-warming topic, sympathetically dealt with. An excellently written book which truly highlights the struggles and barriers people with learning difficulties come across in their life. Written with sensitivity and humour which make this book an enthralling and riveting read. A wonderful read sensitively portrayed. Tanya Bullock is a wonderful writer! Wonderful book - very true to life! 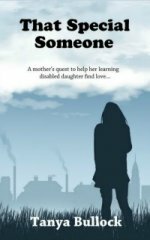 This book was a delightful, with such a clear insight into the very real dilemmas faced by the family of a youngster with learning difficulties .Tanya has a real gift in telling the story with accurate simplicity which illustrates both sides of the story, laced with frustration, humour and love this book is easily a recommended read! Warm, funny and thought-provoking. Full of dramas, laughs and tears with a real dilemma at its heart.